a number for the points difference after counting. All the 0s, 1s and Js are links to the game record. Eight players initially entered. Then gomorra3 withdrew, as it has a bug which sometimes causes it to hang and refuse to make any more moves. I persuaded its programmer, Lars Schäfers, to re-enter it, as this would make the numbers even, which is better than having byes. Shortly before play started, Petr Baudiš decided to enter PueGo (his build of Fuego, not the latest version), so I removed gomorra3 again. In round 1, oakfoam was missing. I learned later that its programmer, Francois van Niekerk, was having connection problems. Oakfoam eventually appeared on KGS, and played from round 4 onwards. In round 2, PueGo appeared to do well against Zen19, in the sequence shown to the right – my impression was that this killed the white group. But there is a ko involved, and the white group eventually lived despite Black making the next two moves in this corner, so I am probably wrong. Also in round 2, stv chased pachi2's stones in a ladder, not noticing that pachi2 had a ladder-breaker. This was disastrous for stv, and it lost the game. In round 6, PueGo chased pachi2's stones in a ladder, not noticing that pachi2 had a ladder-breaker. This was disastrous for PueGo, and it lost the game. In round 8, pachi2 chased oakfoam's stones in a simple unbroken ladder, killing them when it reached the edge of the board. This was disastrous for oakfoam, and it lost the game. In round 12, stv chased Zen19's stones in a ladder, not noticing that Zen19 had a ladder-breaker. This was disastrous for stv, and it lost the game. 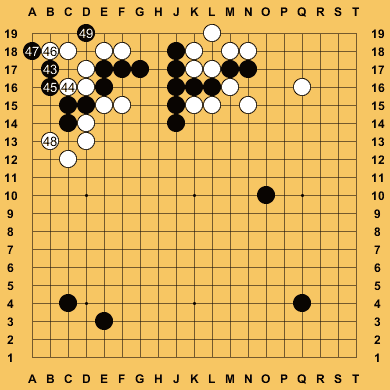 In round 14, PueGo played move 27 as shown to the left, in its game against Zen19. I found this surprising: pulling out its cutting stones, in sente, looks better. Oakfoam, running on a quad-core Intel Xeon E5520 with hyperthreading (so 8 threads). Orego, probably running on one of the five nodes of a custom Linux cluster built by PSSC Labs: the node has two AMD Six Core Dual Opteron 2427 2.2 GHz (12 cores total), 8 GB RAM, Centos Linux. pachi, running on 64 platforms, each x86 64 bits, 32 GB ram, using 22 cores of each, giving about 1500 playouts/s/core at the beginning of a 19x19 game.